There is magic in my world to which I will never get used, like sunlight filtering through the redwoods, fog coming into the San Francisco Bay through the Golden Gate, full moon setting on the Pacific Ocean, baking bread. Each new bread baking project I embark upon is a voyage of discovery and wonder. The occasional bump on the road is part of the itinerary. Today's trip starts in Finland, a magic land of lakes and islands. Spending a couple of hours at the Helsinki airport to connect to a flight to the US does not really count as a visit, so Finland is one of the places in my travel bucket list. While waiting for the realization of my wish, I baked pulla, traditional Finnish buns. The two sources I used to draw the road map for my explorations are this recipe on the Food from Finland site and this family recipe shared on The Fresh Loaf. The idea of adding mashed berries came from this recipe (also on the Food from Finland site). According to this page, "About 50 different berries are found in Finland and 37 of them are eatable." I chose blackberries, as they are plentiful now and the appreciated object of foraging expeditions. I took a number of liberties with the recipes and baked the buns my own way. Stay with me and you'll find out what happened. The special ingredient of pulla is cardamom (cardamomo). This recipe calls for crushed cardamom and having whole cardamom seeds allowed me to comply. I crushed cardamom for pulla using an electric spice grinder (which I use regularly to turn flaxseed, semi di lino, into meal) and, the second time, a small marble mortar and pestle (mortaio e pestello). Both methods work: the first is faster, the second more meditative. Note that I used less cardamom than called for in the recipes I consulted, because I wanted a bread more subtly flavored that I could put on the table at every meal. Addendum on cardamom: if you have cardamom pods, split them to extract the seeds, then crush the seeds. It is actually better to buy cardamom pods, as this is the form in which the spice's flavor keeps best. Note to self: follow this piece of advice next time you bake pulla. The buns are mildly sweet, but I made then just barely so by reducing the amount of sugar. As a result, the tender buns that came out of my oven were a perfect support not only for homemade plum preserve, but also for my homemade fresh chèvre and gravlax (the latter will be the subject of a post next month). Note 1: I had some fresh whey (siero di latte) from making cheese when I made the rolls, so I used two tablespoons of it instead of the same amount of milk (and I used non-fat milk). Note 2: I always add a certain amount of whole-wheat flour when the recipe calls only for white flour to increase the nutritional value of the bread without totally changing its nature. Note 3: the quantity of flour you need depends on whether you use some whole-wheat flour like I did and also on the type of all-purpose flour you choose. As mentioned in previous posts, I use King Arthur Flour all-purpose flour to make all my breads (and this is a statement of fact, not an advertisement). Pour milk into a bowl and stir into it yeast, cardamom, salt and sugar. Stir in the whole-wheat flour and the first two batches of all-purpose flour. When the flour is well incorporated, add the butter and stir it in. Stir in the third batch of flour. Empty the bowl onto your working surface and knead until you have a homogeneous the dough. Use the remaining flour to sprinkle your working surface as needed. The resulting dough is nice and soft, a bit tacky. It reminds me of challah dough. Clean and oil the bowl and place the dough in it. Cover it tightly and let the dough rise until doubled. The time necessary depends quite a bit on the room temperature. The first time it took almost 1 1/2 hour, while the second time an hour. Place a rack in the middle and preheat oven to 425 F / 218 C. Place a half sheet pan (18 x 13 inches / 46 x 33 cm) in the oven. Turn the dough onto the lightly floured working surface and cut it into 12 pieces each weighing 2 1/2 oz. / 70 g. I weigh the pieces to make sure they are all of about the same size. Take a piece of dough, flatten it into a (rough) round, fold flaps towards the center (as if you were closing an envelope) all around to make a kind of parcel. Turn it so the seam is down, cup it with your hand, then move the hand in circles to make the surface of the bun tighter. Make sure the working surface is not floured, otherwise the ball of dough will slide when you try to make it go in circles. I wish I had a video of myself shaping buns: I put it on my to-do list. In the meantime, if you need a visual aid to learn how to shape buns by rolling the dough with your hands, this post has a nice video. Place shaped buns evenly spaced on a silicone baking mat that fits into the half sheet pan (or a piece of parchment paper of adequate size). A half sheet pan provides enough space for the buns to expand. Since you will move the baking mat onto the (hot) baking sheet currently in the oven, I recommend you put it on another baking sheet, turned upside-down, so the transfer will be an easy slide. Cover the buns and let them rise for 15 minutes. Brush the surface of the buns with the beaten egg. Take out of the oven the hot baking sheet, move the silicone baking mat with the buns onto it, then put in the oven. Bake buns for 12 minutes, then check them. If not yet nice and golden, bake another minute and check again. Repeat as needed. (My buns needed 13 minutes to bake to perfection.) Take the buns out of the oven and slide them onto a rack. Let cool for at least 15 minutes before tasting them. They were perfect, golden outside, tender inside, with the richness provided by butter and milk and the fascinatingly exotic aroma of cardamom. Addendum (wherin I describe a bump in the road): Three of the buns in the first batch got a blackberry filling for which I followed the instructions in this post. (I was reminded of making bialys, with blackberries instead of onion and poppy seeds.) However, the oven spring of my Finnish buns was so enthusiastic that the filling turned into a sort of icing, with attendant drip on the side. The buns were perfectly good, but not visually appealing. So for the next batch, I devised the process described in the recipe above, which worked much better. I was worried it would not, so I made only one specimen, portrayed in the photo above, which was promptly devoured with delight by my husband. Fortunately, it is still blackberry season, so I'll have a chance to make a few more batches and enjoy these buns that came to me as a gift from the land of lakes and islands. 1 I had failed to specify the amount of butter and added it after publishing the post. Apologies to the early readers and many thanks to Gaylyn for alerting me about the omission. 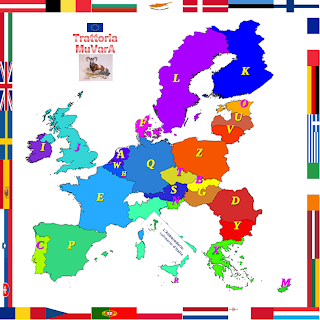 My pulla participate to the eleventh installment of the Abbecedario culinario della Comunità Europea (European Community Culinary ABC), an event organized by Trattoria MuVarA that will bring us to visit 26 countries of the EU (all except Italy) using the alphabet as guide. K like Kalakukko (Finland) is hosted by Tamara of Un pezzo della mia Maremma. This page contains Kalakukko's recipe and the list of dishes contributed to the event. I am sending these buns to the August edition of Panissimo, a monthly event created by Barbara of Bread & Companatico and Sandra of Indovina chi viene a cena? and hosted this month by Barbara. And, via Barbara, to the monthly showcase Sourdough and Yeast by Wisla (in Polish). You can see the roundup in this post. Finally, I am sending my pulla to Yeastspotting. This post contains the second part of the roundup and links to the other two parts. or launch the panini finlandesi audio file [mp3]. Ci sono magie nel mio mondo alle quali non mi abituerò mai, come i raggi del sole che filtrano nel bosco di sequoie sempreverdi, la nebbia che entra nella Baia di San Francisco attraverso il Golden Gate, la luna piena che tramonta nell'Oceano Pacifico, fare il pane. Ogni nuovo pane che faccio è un meraviglioso viaggio di esplorazione. L'occasionale tratto difficile di percorso fa parte dell'itinerario. Il viaggio odierno parte dalla Finlandia, magica terra di laghi e isole. Trascorrere un paio d'ore all'aeroporto di Helsinki in transito per gli USA non conta come visita e quindi la Finlandia rimane uno dei paesi che vorrei visitare. In attesa di realizzare il mio desiderio, ho sfornato dei pulla, panini tradizionali finalndesi. Le due fonti che ho usato (entrambe in inglese per preparare una cartina per il mio viaggio di esplorazione sono una ricetta sul sito "Food from Finland" e una ricetta di famiglia sul sito The Fresh Loaf. L'idea di aggiungere delle more viene da questa ricetta (anch'essa dal sito Food from Finland). Certo, mi sarebbe piaciuto utilizzare more artiche, ma non so dove trovarle in California. Ho apportato diverse variazioni alle ricette consultate e ho cotto i panini a modo mio. Seguitemi e scoprirete che cosa ho combinato. L'ingrediente particolare di questi panini è il cardamomo. Questa ricetta specifica che per i panini occorre il cardamomo pestato e dal momento che ho il cardamomo in semi, non ho avuto problemi a seguire questa indicazione. Per frantumare il cardamomo ho usato una volta il macinaspezie elettrico e un'altra volta mortaio e pestello di marmo. Entrambi i metodi funzionano: il primo è più rapido, il secondo più meditativo. Da notare che ho usato un po' meno cardamomo di quanto indicato nelle ricette che ho consultato, poiché volevo dei panini dal sapore meno forte da poter utilizzare per ogni pasto. Nota sul cardamomo: se avete i baccelli di cardamomo, apriteli ed estraetene i semi, poi frantumate i semi. Di fatto è meglio acquistare il cardamomo in baccelli, poiché questa è la forma in cui il sapore della spezia si conserva meglio. Nota a me stessa: segui questo consiglio la prossima volta che fai i panini finlandesi. I pulla sono un po' dolci, ma io li ho fatti solo vagamente dolci riducendo la quantità di zucchero. I soffici panini che ho sfornato si sono comportati benissimo come supporto non solo della mia conserva di prugne, ma anche dei miei caprino fresco e gravlax (quest'ultimo sara il tema di un post il mese prossimo). Nota 1: quando ho fatto i panini avevo del siero di latte fresco dalla mia attivita casearia, quindi ne ho utilizzati due cucchiai (30 ml) invece della stessa quantità di latte (e ho usato latte magro). Nota 2: aggiungo sempre della farina integrale quando faccio una ricetta che usa solo farina bianca in modo da aumentare il valore nutrizionale del prodotto finale senza stravolgerne la natura. Nota 3: la quantità di farina necessaria può variare a seconda se decidete di usare della farina integrale come ho fatto io e a seconda del tipo di farina bianca utilizzata. Versare il latte in una ciotola capiente e stemperarci lievito, cardamomo, sale e zucchero. Aggiungere la farina integrale e 200 g della farina bianca. Quando la farina è ben incorporata, aggiungere il burro e incorporare anch'esso. Aggiungere il terzo mucchietto di 100 g di farina e mescolare. Svuotare la ciotola sul piano da lavoro e impastare a mano fino ad ottenere un impasto omogeneo. Utilizzare il resto della farina per infarinare il piano da lavoro al bisogno. L'impasto finale risulta soffice e leggermente appiccicoso. Pulire la ciotola e oliarla bene, poi metterci dentro l'impasto. Coprire bene (con della pellicola) e lasciar lievitare l'impasto fino a quando raddoppia di volume. Il tempo necessario dipende molto dalla temperatura ambiente. La prima volta il mio impasto ha impiegato poco meno di un'ora e mezzo, la seconda un'ora. Posizionare una grata al centro del forno, mettere una placca da forno (minimo 46 x 33 cm) su di essa e preriscaldare il forno a 218 C.
Prendere un pezzo di impasto, schiacciarlo per formare un cerchio (approssimativo) e poi ripiegare i lembi verso il centro (come se chiudeste una busta da lettera) tutto intorno a formare un pacchetto. Girarlo sottosopra, avvolgerlo con le mani e poi fargli disegnare dei cerchi in modo che la aumenti la tensione in superficie. Per quest'azione il piano di lavoro non deve essere infarinato, altrimenti la pallina di impasto scivola. Mi piacerebbe avere un video dove si vedono me mie mani al lavoro: ho intenzione di farlo. Nel frattempo, se avete bisogno di un aiuto visivo per dare la forma ai panini con le mani, date uno sguardo a questo post. Man mano depositare i panini su un tappetino da forno di silicone (o un pezzo di carta da forno) grande abbastanza da coprire la placca di almeno 46 x 33 cm: queste dimensioni sono necessarie per dare ai panini lo spazio per lievitare. Dal momento che poco più tardi metterete il tappetino sulla placca rovente che ora è nel forno, vi consiglio di poggiarlo su un'altra placca da forno girata sottosopra. Coprire i panini con un canovaccio o della pellicola e farli lievitare per 15 minuti. Spennellare la superficie dei panini con l'uovo. Tirare fuori dal forno la placca rovente e far scivolare su di essa il tappetino (o carta da forno) con sopra i pulla. Cuocere in forno per 12-14 minuti, fino a quando i panini sono dorati sopra e sotto (i miei si sono cotti in 13 minuti). Sfornare e trasferire i panini su una gratella. Lasciar intiepidire almeno 15 minuti prima di assaggiarli. Perfetti! Dorati in superficie e morbidi dentro, dal sapore ricco di burro e latte e resi un po' esotici dall'affascinante aroma di cardamomo. Addendum (nel quale descrivo una piccola difficoltà che ho risolto durante il viaggio): Su tre dei panini della prima infornata ho messo un po' delle more schiacciate, come indicato su questo post. Ma la lievitazione nel forno è stata così entusiastica che il ripieno originario è diventato una specie di glassa con tanto di rivoletto scivolato di lato. I panini erano buoni, ma non belli da vedere. Allora per l'infornata successiva ho seguito il metodo descritto in alto, che ha funzionato bene. Preoccupata però di effetti collaterali imprevisti, l'ho applicato solo ad un panino che, una volta uscito dal forno ed immortalato nella foto in alto, è stato prontamente divorato da mio marito. Per fortuna, è ancora stagione di more e quindi avrò modo di preparare qualche altra infornata di questi deliziosi panini, dono della terra di laghi e isole. 1 Mi ero dimenticata di specificare la dose di burro e l'ho aggiunta dopo aver pubblicato il post. Mi scuso con i lettori e ringrazio Gaylyn che mi ha fatto notare l'omissione. Con i miei panini finlandesi partecipo all'undicesima tappa dell'Abbecedario culinario della Comunità Europea, un evento organizzato dalla Trattoria MuVarA che ci porterà a visitare i 26 paesi della Comunità Europea (eccetto l'Italia) usando le lettere dell'alfabeto come guida. K come Kalakukko (Finlandia) è ospitata da Tamara di Un pezzo della mia Maremma. Questa pagina contiente la ricetta del Kalakukko e la lista dei piatti contribuiti all'evento. Mando questo pane anche all'edizione di Agosto di Panissimo un evento mensile creato da Barbara di Bread & Companatico e Sandra di Indovina chi viene a cena? e ospitato questo mese da Barbara.